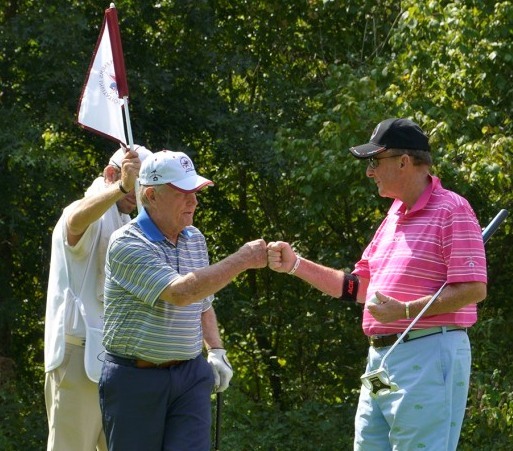 Barbara and Jack Nicklaus hosted the third Creighton Farms Invitational at award-winning Creighton Farms in the Northern Virginia city of Leesburg. The event, held earlier this month, included a reception, dinner and auction held in the clubhouse, followed by a golf tournament hosted the next day. Surprise co-auctioneer joining in on the program was 4-year-old Aiden Lipscomb, who has battled a cancer of the muscles since he was 5 months old. Now in remission and dressed for the evening in a Superman cape, with the letter A on the back, Aiden inspired the crowd to raise its bids. The dinner concluded with a lively Q&A between Nicklaus and ESPN golf and College GameDay reporter and essayist Tom Rinaldi, winner of 10 National Sports Emmy Awards. After the reception, participants had the opportunity to golf on the award-winning Jack Nicklaus Signature Golf Course at Creighton Farms. This year, the course—a centerpiece to the Creighton Farms community—was recognized in Golfweek’s Best Residential Courses list. Participating celebrities included Roger Clemens, record seven-time Cy Young Award winner and two-time World Series champion; Joe Theismann, former quarterback for the NFL’s Washington Redskins and sportscaster; Peter Bondra, former NHL hockey player with the Washington Capitals and Ottawa Senators; Bob Dandridge, Hall-of-Fame NBA player with the Milwaukee Bucks and Washington Bullets; Ricky Ervins, former NFL running back for the Washington Redskins and San Francisco 49ers; Kevin Grevey, former NBA small forward and shooting guard with the Washington Bullets and Milwaukee Bucks; and Rod Langway, former NHL defenseman with the Montreal Canadians and Washington Capitals. Southworth and Deitch then presented a check for $100,000 to the Nicklaus Children’s Health Care Foundation.